Belfast underwent a significant increase in shipbuilding activity during the 19th century with the change from traditional wooden ships to hulls made from iron and later steel. There were 3 shipyards on the River Lagan up until the end of the 19th century when it reduced to 2, Workman Clark and Harland & Wolff. During World War I German U Boats operated in British and Irish waters. The Royal Naval Air Service operated airships from Bentra near Whitehead. The Royal Navy maintained a presence in Belfast and HMS Caroline was moved to Belfast to serve as a depot ship for the Royal Naval Volunteer Reserve from 1924 after she was decommissioned and placed in Reserve from 1922. 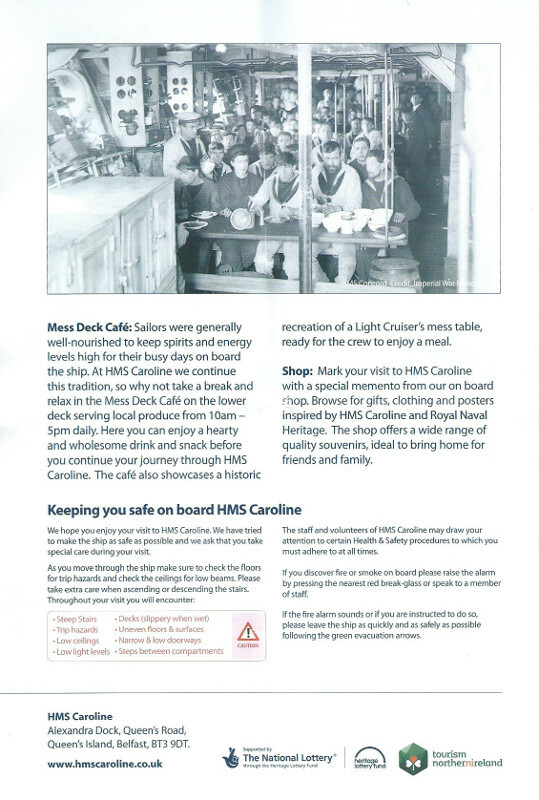 HMS Caroline was built by Cammell Laird, Birkenhead, her keel being laid down in January 1914 and launched on 29th September 1914 for fitting out. She was completed in December 1914 and was commissioned into service on 4th December 1914. HMS Caroline was one of a number of C Class Light Cruisers and she was to serve as part of the Royal Navy's Grand Fleet based at Scapa Flow and spend her war service patrolling the North Sea. HMS Caroline saw action against the German Imperial Fleet at the Battle of Jutland in 1916. In 1919 after the conclusion of hostilities, HMS Caroline was moved out to the East Indies Station where she finished her active service. After moving to Belfast in 1924, she went to Harland & Wolff shipyard to have her boilers and armament removed for her continued service as a depot ship for the R.N.V.R. 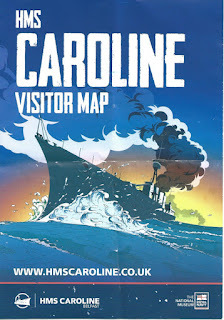 HMS Caroline was returned to Royal Naval active service during World War II serving as the headquarters for the Royal Navy in Belfast. As the war progressed the role and function of the Royal Navy expanded and premises were requisitioned around the harbour and city for naval use. 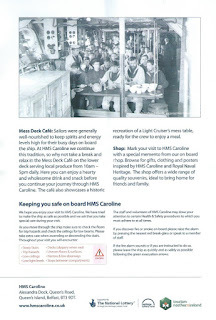 A lot of the ratings wore HMS Caroline hat tallies although not actually based on board. After the conclusion of hostilities HMS Caroline again reverted to her peacetime role as a depot ship for the R.N.V.R. 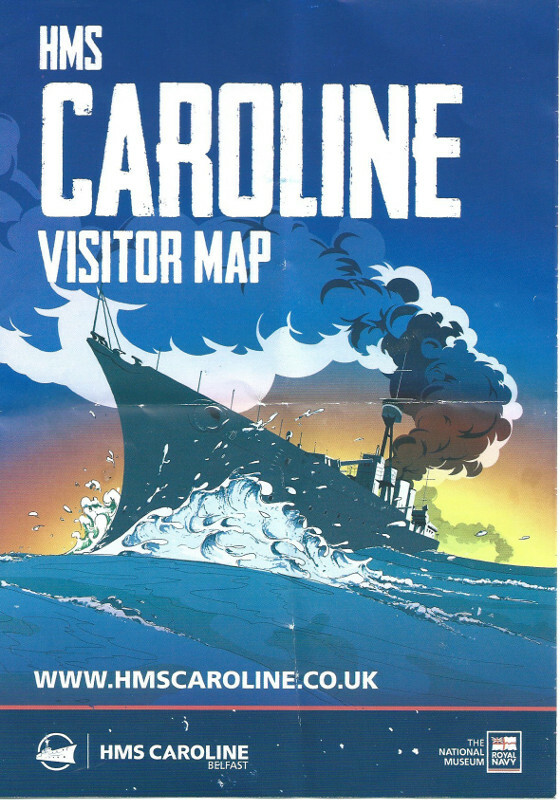 HMS Caroline was given a refit at Harland & Wolff shipyard in 1951. She continued as a depot ship until 2009 when the R.N.V.R. moved ashore and was finally decommissioned out of service in 2011. Her ensign was laid up in Belfast's St. Anne's Cathedral. At that point the future of HMS Caroline was uncertain as the second oldest Royal Naval warship. Proposals were made to move her to Portsmouth and in 2012 initial funding of £1 million was secured from the National Lottery Heritage Fund towards restoration and the announcement that she was to stay in Belfast. In October 2014 an announcement about a further £12 million towards the restoration of the ship with the planned opening of the ship as a museum in time for the centenary of the Battle of Jutland on May 31st 2016. Restoration work is ongoing with the teak deck planking having been lifted. Paint analysis of the ship has revealed 38 different shades of grey used on the ship during her service. 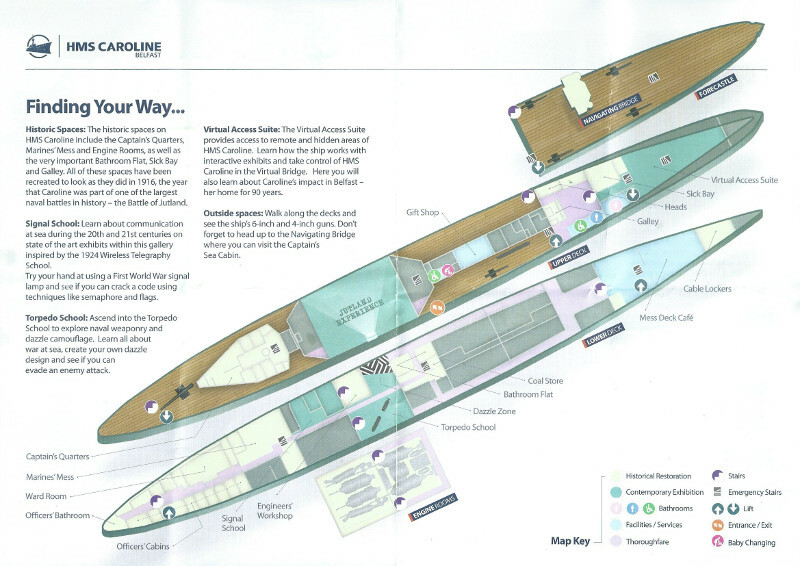 The new information has enabled experts to determine her colour during different periods of her service and determine the exact shade she was painted during World War I.
HMS Caroline is currently berthed in the Alexandra Dock behind the Titanic Film studios where 'Game of Thrones' is filmed. It is easily reached by bicycle. As part of the plans to turn her into a floating museum, the nearby old Harland & Wolff historic Titanic Pump House is to be turned into a visitor centre for the ship. As restoration work is ongoing the ship is not yet open to the public but she can still be seen from the security fencing. 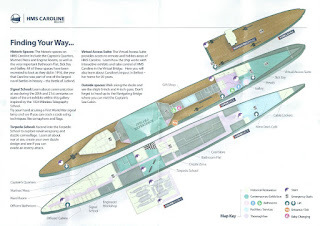 For anyone interested in maritime history she will be well worth a visit, alongside the White Star Line tender for the RMS Titanic, SS Nomadic and the Titanic visitor centre. Revisited HMS Caroline on Monday 30th May 2016, before the 100th commemoration of the Battle of Jutland on 31st May 2016 to be held on board, as the last surviving ship that took part in the sea battle in which 6000 Royal Navy sailors lost their lives, of which 800 were Irish. The restoration is impressive considering her external condition in 2015. She is now a world class museum.